Join Science Writers in New York (SWINY) on May 29 for an evening with Maggie Koerth-Baker, author of Before the Lights Go Out: Conquering the Energy Crisis Before It Conquers Us. Maggie will discuss how our energy systems were built, how they work today, and how they will influence what we can and can’t do over the next 30 years. She’ll also give us some behind-the-scenes insights into the process of writing her book. If you write about science or care about the future of energy in America, this is a must-see event. We will meet in room 308 at the CUNY Graduate School of Journalism, 219 West 40th Street, from 6 to 8 p.m. Space is limited, so RSVP now. 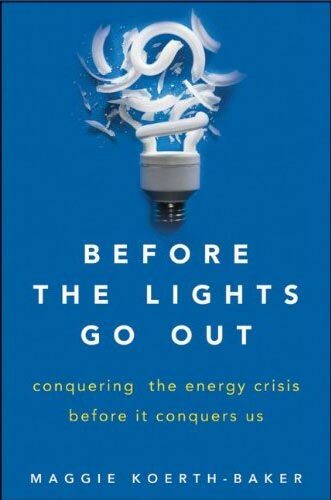 Before the Lights Go Out explores big-picture nuance that gets left out of the day-to-day chatter about energy. What are the big trends that will shape what we can and can’t do over the next 40 years? How does our electricity infrastructure work? Discover how that infrastructure is a lot more interesting (and a lot more complicated) than most laypeople realize. Maggie’s storytelling includes some fun and funny history of how our current infrastructure came to be. Her critical analysis explains both why we have to solve our energy problem, and why solving it is going to be harder than many climate hawks want to believe. Maggie’s book makes a confusing subject accessible by offering a more nuanced perspective on a topic that’s often very ideology driven. Maggie Koerth-Baker is science editor at BoingBoing.net, one of the most-read blogs in the United States with millions of monthly readers. She also is a freelance science journalist whose work has appeared in magazines like Discover, Popular Science, and New Scientist, and on websites like Scientific American and National Geographic News. In addition to Before the Lights Go Out, Maggie is the author of Be Amazing, a tongue-in-cheek self-improvement guide written with the publishers of mental_floss magazine. Not a member? Join SWINY here (for just $25/year) so that we can continue to support more such activities. I really tried. Twice. And again. Paypal will not let me pay you guys. Please use google wallet or amazon payments. Paypal thinks I have a paypal account, and I know I don’t have one. Alas, a future member lost. Peter: I’m sorry you are having issues with PayPal. Contact me offline at bonnerj at swiny dot org. I’d like to help you work this out.